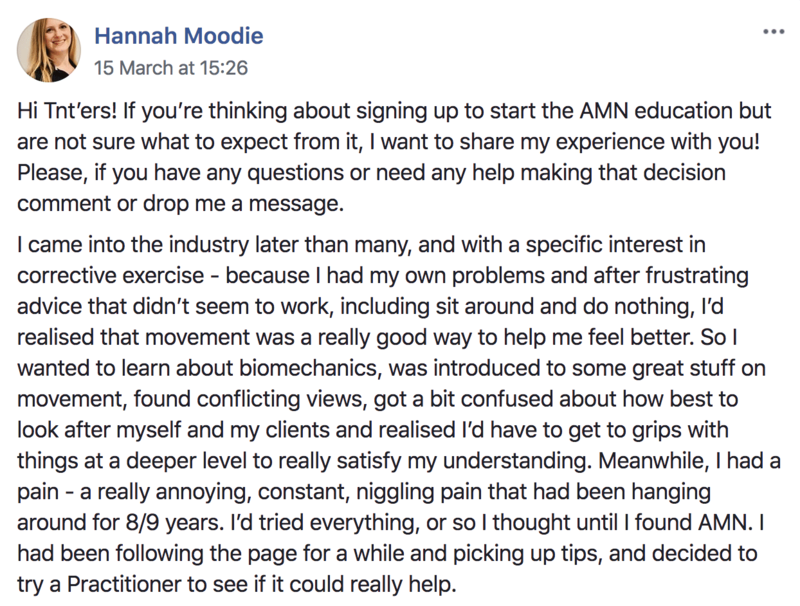 At AMN Academy, we've been building a movement of Trainers and Therapists all over the world who want to understand the complexities of the Human Organism in a more meaningful way. 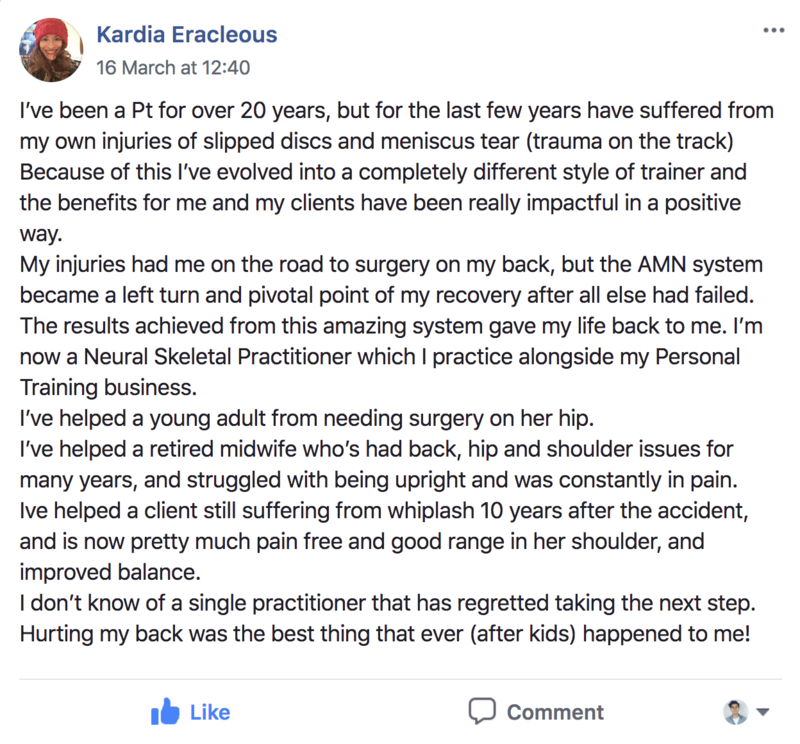 Practitioners who look at their clients and patients as the sum of their parts, not as a bunch of independent systems, to be treated individually. 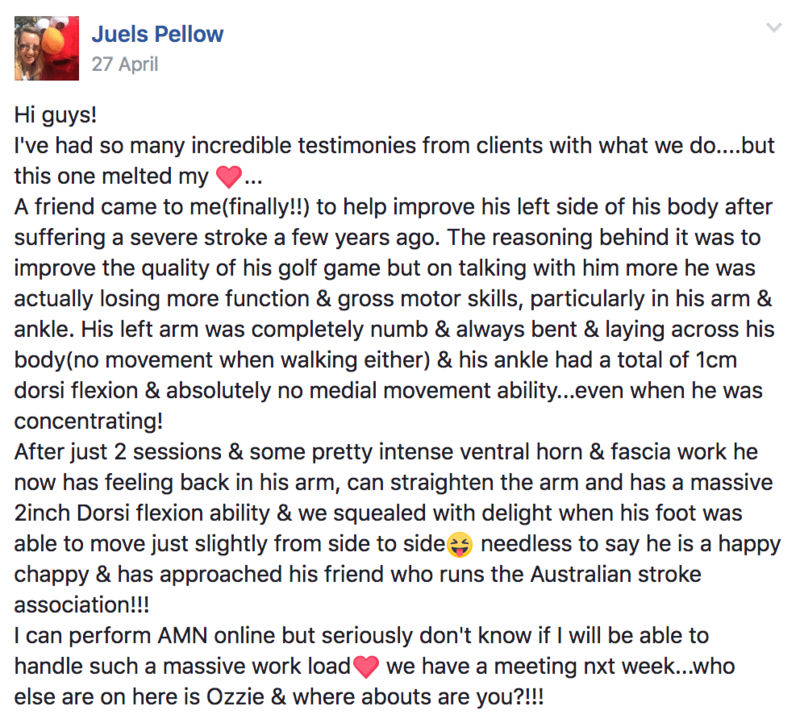 Our Practitioners are changing lives, day-in and day-out as STANDARD PRACTICE. They're helping people who have tried it all, and lost hope. They're helping people who had all but given up after being told there was nothing that could be done for them. They're helping people who have been living with pain and disfunction for years, and in some cases decades. 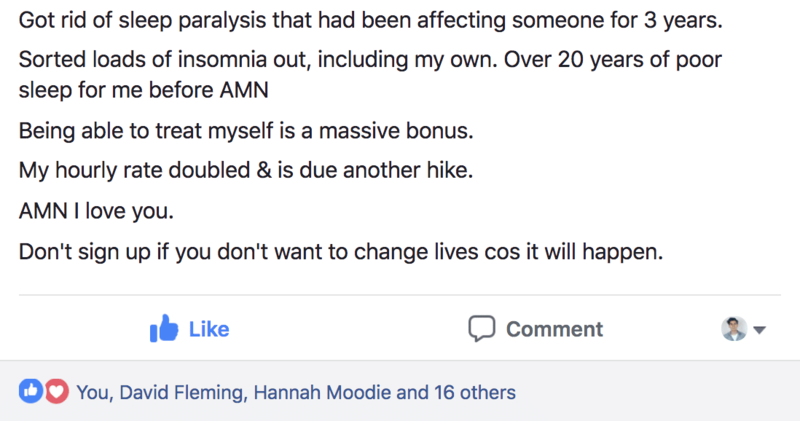 It's common for their clients to call them 'Miracle Workers', 'Jedi', 'Magic men and women' because they'd given up hope of ever getting better. 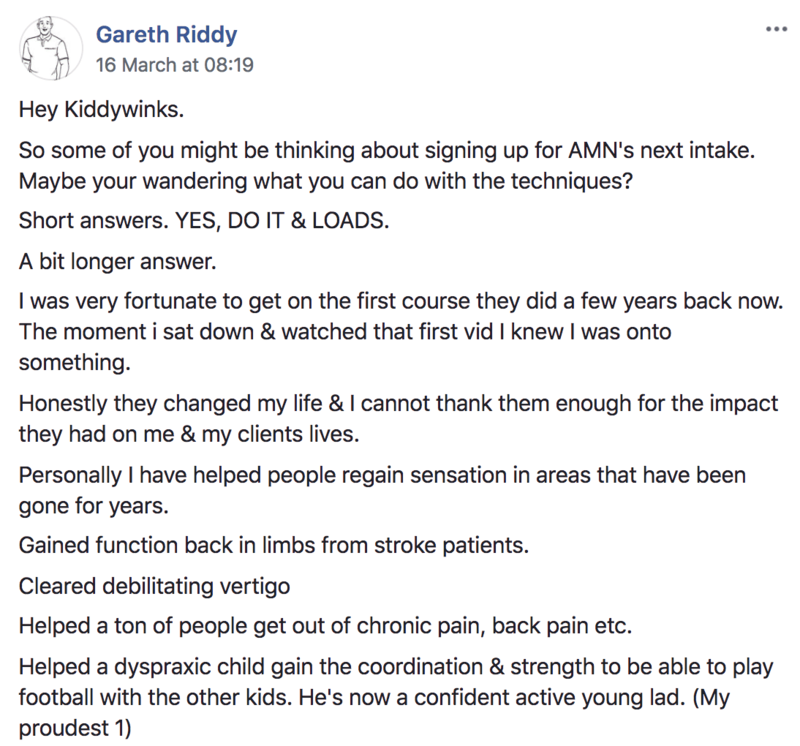 But when you understand the science and art that is Applied Movement Neurology, you gain an understanding of the body from a perspective that allows you to see things in an entirely different light. Access the AMN Certifications from anywhere in the world with our state of the art education portal, eliminating the need for expensive travel and time out of your busy schedule to attend live courses. 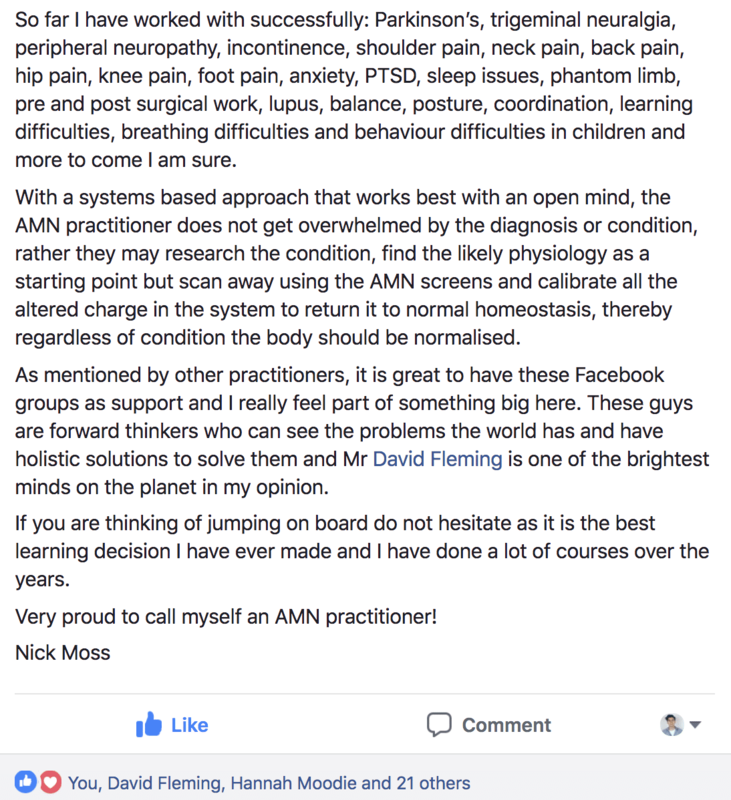 The Success of the AMN Movement is down to the success of our Practitioners. 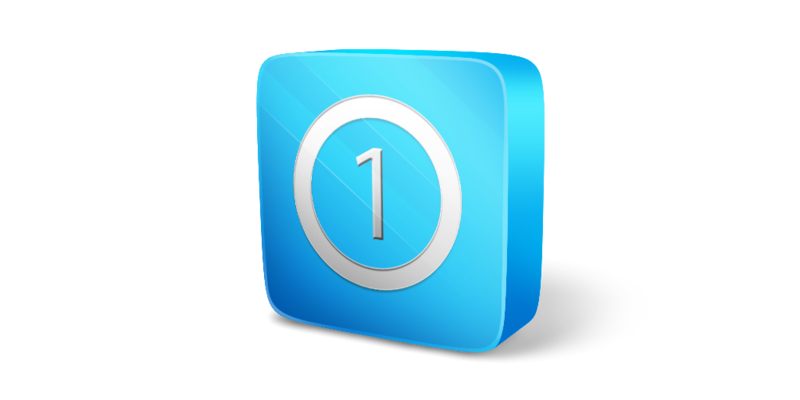 Unlike most courses we keep an active and thriving online community. 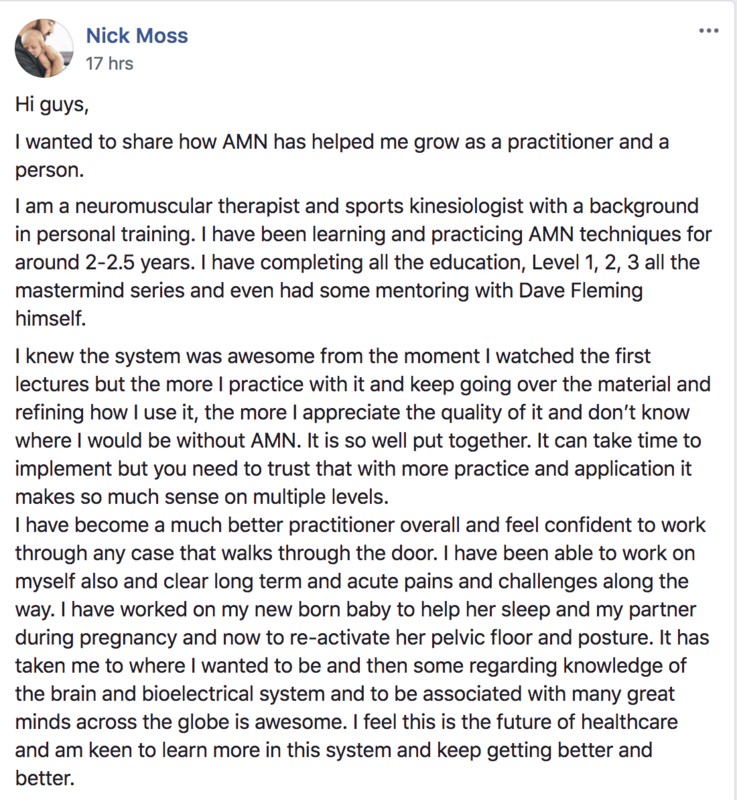 Joining the AMN Practitioner community gets you access to other Practitioner around the world as well as the team here at AMN Academy. You can access all AMN Education from the handy mobile app that will allow you to listen to lectures on the go, or watch the Video Tutorials whenever you need to refresh your memory. Start your journey from a familiar reference point and learn exactly how Movement affects the Brain and how the Brain affects Movement. 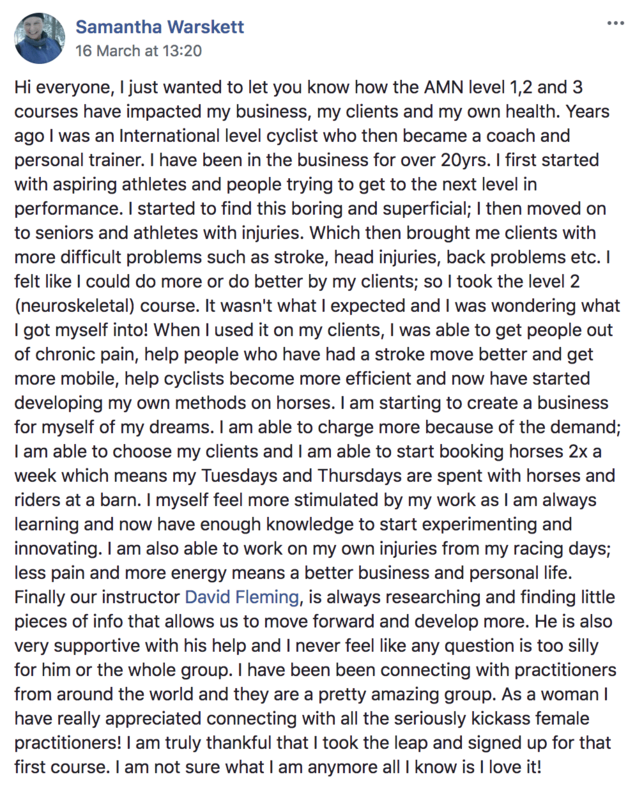 Gaining an understanding of the Physiology of the Brain and Nervous System will help you see movement, muscle recruitment, muscular imbalances, postural distortions and issues with coordination and flexibility in a way that makes more sense, and will give you the confidence to eliminate these types of issues, once and for all. 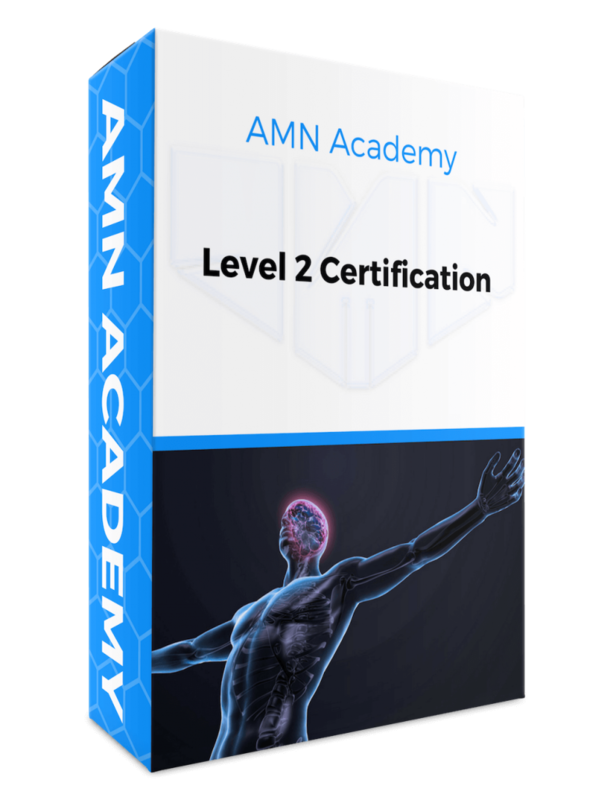 This course starts out by giving you a comprehensive understanding of the different cortices of the brain, along with the anatomical knowledge of the nervous system that you'll need to master the AMN Material. We then focus on the Functional Anatomy of the Cerebellum, one of the most influential structures in the brain, when it comes to movement. You'll learn how to determine which areas have faulty output and we'll equip you with the tools you need to provide the appropriate input. Mastery of this section will allow you to improve things like muscle recruitment, muscular imbalance, the accuracy of movement, balance in general and much more. You'll also learn how to assess the output of a person's motor system. 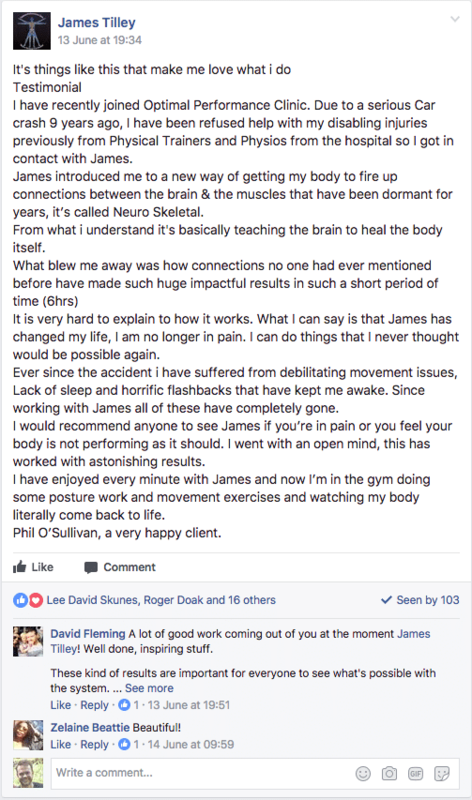 The second part of this course looks at Posture from the Neurological and Reflexive perspective. But what happens when you start to try and move, or your attention is focused on something else? 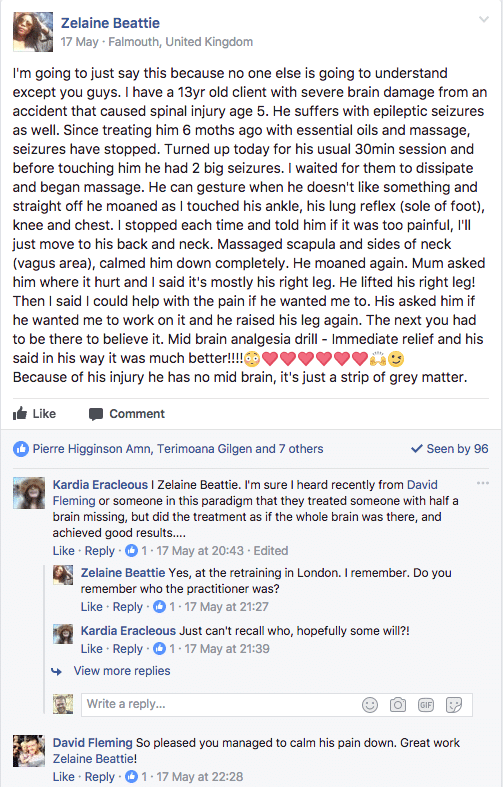 Improving someone's ability to hold themselves upright needs to be approached by addressing the reflexes that keep our extensors 'switched on'. We'll teach you how to assess the spine, in a quick and easy way and then how to fire the specific reflexes needed to establish good posture. 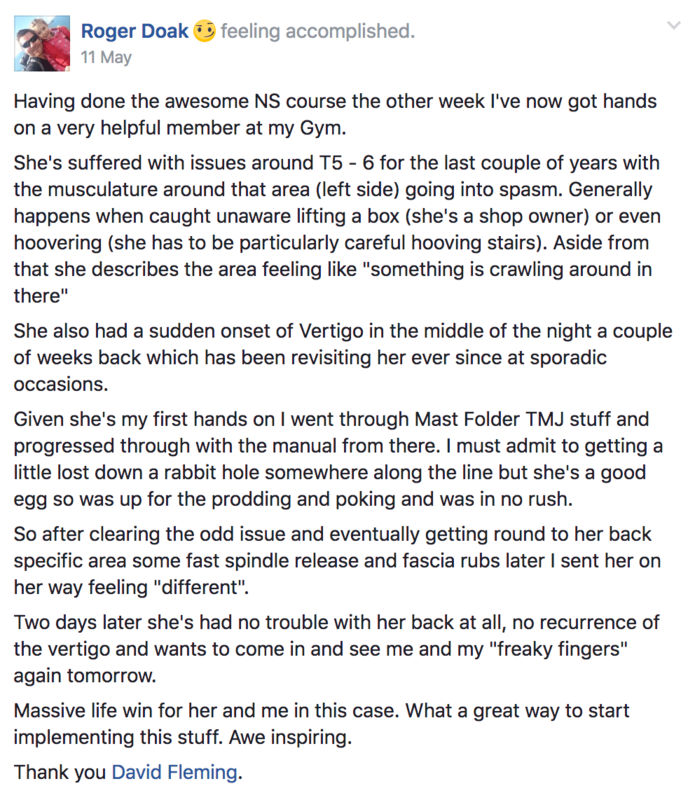 In the last section of this course we look at why some people seem to be unable to effectively coordinate themselves during complex movement. Contrary to popular belief, being uncoordinated isn't a fixed trait. 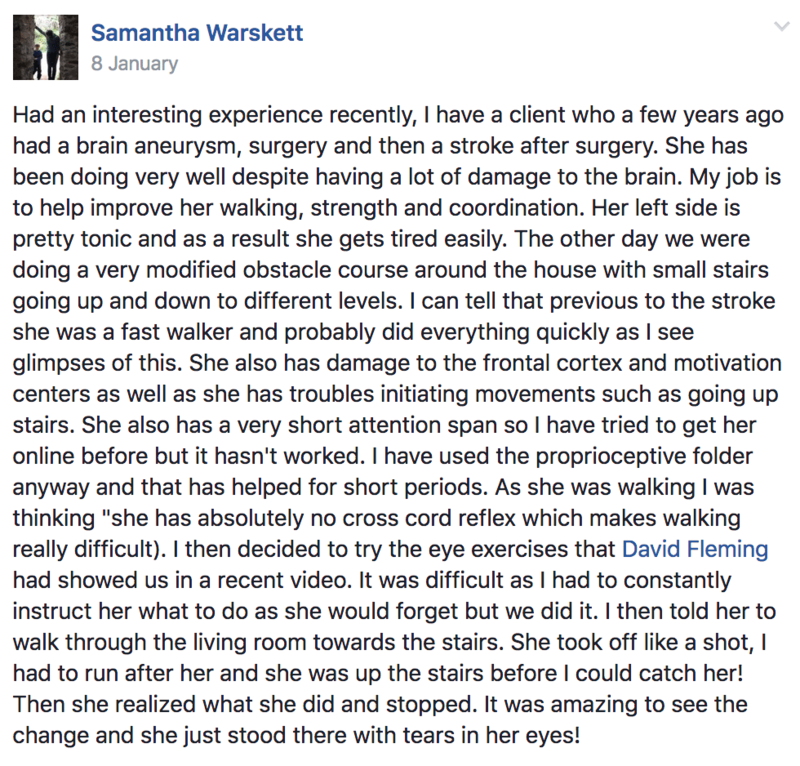 By stimulating certain visual-stream pathways with light stimulus, and then providing a person with movements designed to challenge their coordination, we're able to help people unlock their potential to move in a more coordinated manner. The AMN Level 1 is open to any qualified Health or Fitness Professional. 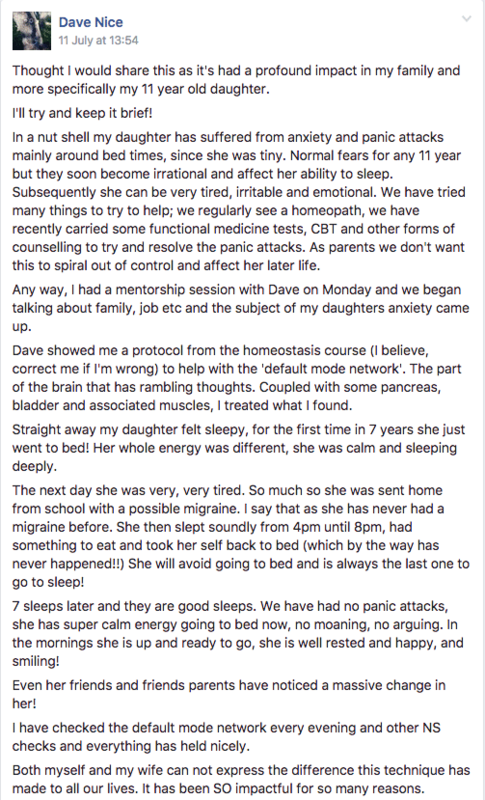 This Level of the Certification starts to go deeper into the inner workings of the body and looks at some of the more complex structures that can cause movement related problems and be involved in chronic pain. This course is where we really work on mastering the hands-on techniques of the AMN system. We term this process, Calibration. 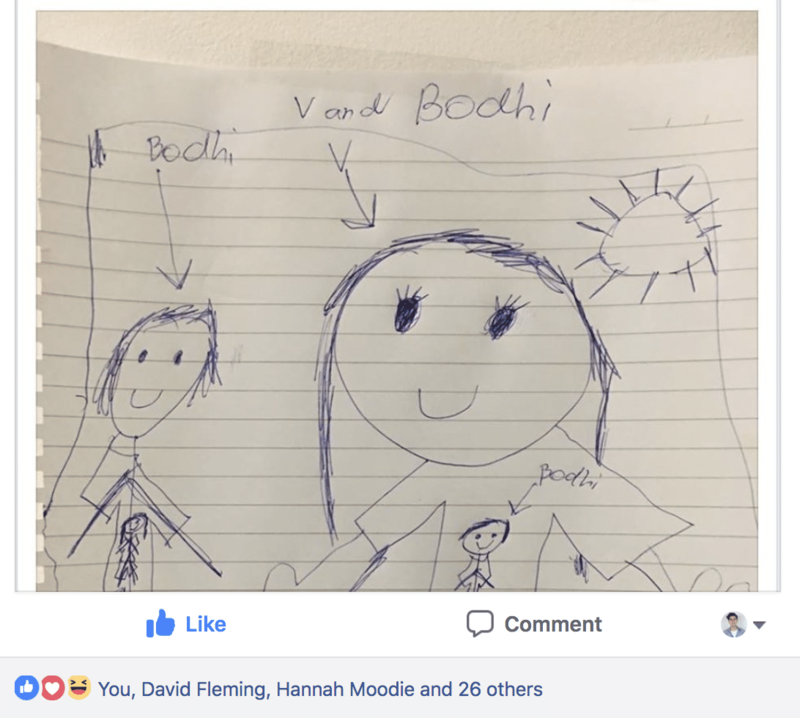 At this stage we're still looking primarily at the volitional motor system, but we also start to draw in investigation of deeper structures such as the internal organs and hormones. 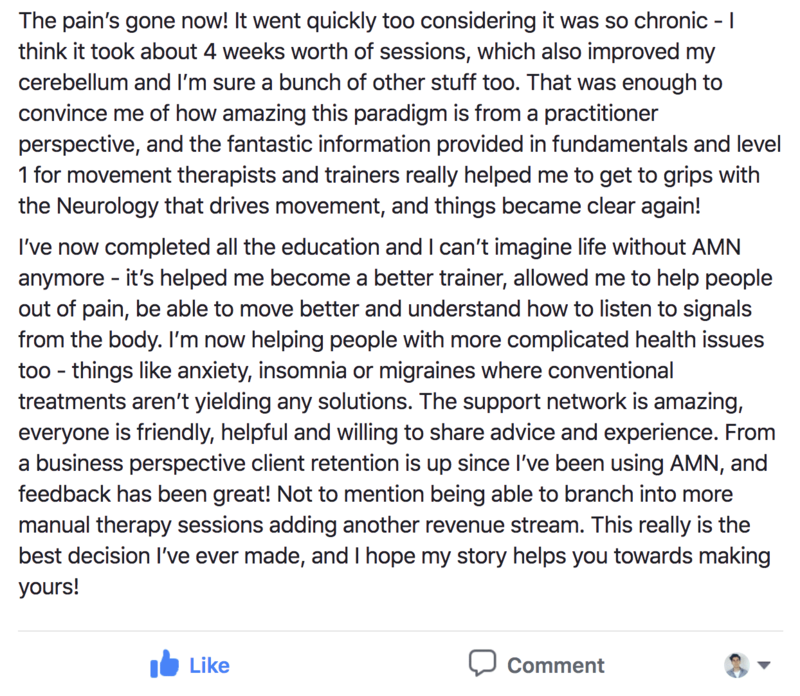 Mastery of this level will allow you to start being incredibly effective at resolving pain in people who have had historical issues for years. The Level 2 Certification is open to AMN Level 1 Students only. The Level 3 Certification goes 'deep down the rabbit hole" as our Practitioners like to affectionally say. It's in this Level that you really master the most complex cases out there. 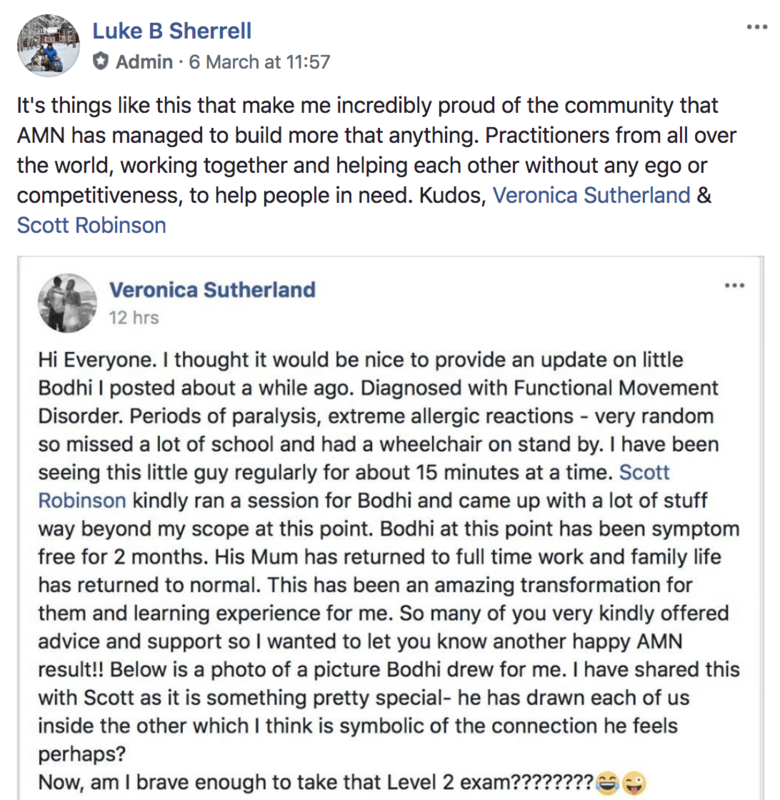 In this Level, we deal with the sensory Autonomics. 80% of the information that travels form our nerve endings to our brain that are dealing with all of the information that is from the things that are keeping you alive. We all know that the emotions can affect the way our body feels. Think about the last time you were stressed or anxious. These emotions, and in fact all emotions, have physical projections or representations. But it’s not just the emotions we’re experiencing right now that can have an effect on our health. Historical emotional conflicts can have a huge impact on how we move, how we feel, and can, in some cases, be a catalyst for unpleasant chronic conditions and disease states. Emotional memories or memories of emotions directly influence our health. Assessing from this reference point can allow you to uncover the deepest correlations of your clients problems or dysfunctions. This screening process allows you to improve reflexive control of respiration from the level of the brainstem making dramatic and in some cases instantaneous changes to the way we breathe. Learn how to assess for current or historic bacterial, fungal, viral and parasitic correlations to the immune system. 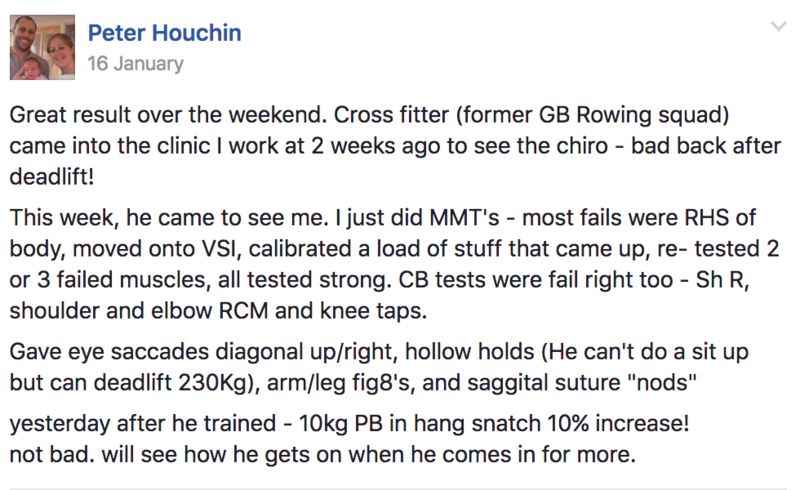 This assessment process can be the missing link in a lot of people's skill set that will open the door to helping your clients and patients. * United Kingdom residents subject to applicable Value Added Tax. How Long Do The Courses Take, Are There Any Time Limits? You can take the courses at your own pace, there are no time limits on any of the courses. On average we would expect Level 1 & 2 to take around 3 months each and Level 3 to take slightly longer to complete if you have between 3-5 hours per week to commit to your study. How much is the Course In US dollars/ Australian Dollars etc? We're unfortunately unable to tell you exactly how much the cost is in other currencies because it will vary depending on your bank or credit card company, and fluctuates from day to day with the international exchange rate. The best thing to do is check google for a rough estimate, or for an exact amount you would need to speak to your bank or card company directly. There is a 14 Day Money Back Guarantee, so you have a two week cooling off period in the event that you change your mind. At the end of each course there is an exam. Upon successful completion of the exam you will be a Certified Applied Movement Neurology Practitioner.